Got another SweetWater from the beer club. 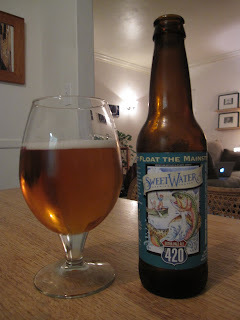 This one clearly identifies the folks at SweetWater as stoners, because they wouldn't so proudly call it 420 otherwise. The bottle says it was conceived on 4/20, and that's great, but they don't name any of their other beers by their conception dates. Buncha hippies. The bottle also says "Drink 'Em If You Got 'Em!" Much better than the "Beer You've Been Training For" BS on the IPA bottle. They call this a West Coast-style pale ale. I guess at first glance, the immediate comparison that would come to mind is Bear Republic's XP- more because they both claim to have something extra relative to a regular pale ale than anything else. I admit I haven't had XP yet, so I can't compare them directly. But I can't imagine that XP smells like the 420. The 420 smells exactly like Kraft caramels- you know, the ones you use to make caramel apples when you're a kid. I'm not sure whether I should be put off (because it makes it smell like something other than beer) or allured (because I absolutely love those caramels) by that. What I can directly compare this to is Sierra Nevada's pale ale, of which I had 6 or 7 on a camping trip last weekend. If SN's is a typical West Coast pale ale, and I think most folks around here would agree that it is, then the 420 is not really a West Coast style pale ale. That's not to say that the 420 is bad, though. It's got a lot of rich flavor, including more of the caramelly sweetness, and a decent hop bitterness. But to me it's exactly the richness that prevents it from being truly West Coast- pale ales around here tend to be crisp and clean. It's sort of like the difference between a Honeycrisp and a Granny Smith. I guess this review sort of went on digression about whether or not they falsely advertised the 420 on the bottle, which probably isn't where it should've gone because in the end it doesn't really matter all that much. More to the point- I like this beer. It definitely helps that I like caramel, and despite the richness the hops are just potent enough to prevent it from going on sweetness overload. So I'm glad I've got two more of these in the beer club box. SN Pale was my favorite till I tried Sweetwater 420. Just wish it wasn't so expensive.